An Aberdeenshire fisherman has been ordered to pay his former wife of 25 years more than £3.3m under a divorce settlement. Ann Watt was awarded more than double the amount she claimed husband James had offered. Mr Watt, 53, of Rosehearty, is a successful businessman, fishing for mackerel and herring. A judge at the Court of Session in Edinburgh ordered that £2m be paid immediately. Mrs Watt said her husband had stated, at about the time they separated, that he was worth between £10m and £12m. She said at one stage her husband had told her he had signed a document which would result in her not getting anything. 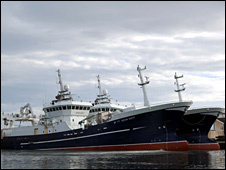 The court heard Mr Watt had an interest in a firm Mewstead which borrowed £15m from the banks to build two 'super trawlers' Ocean Quest and Ocean Venture. Judge Lady Smith said Mrs Watt already had ownership of some property and more would be transferred to her, but the judge ordered that Mr Watt pay his ex-wife £3,369,000 as a capital sum.